Clean Life Play Top Bird Cage - Green White? Description Clean Life bird cages feature a uniquely molded plastic base with built-in seed guard and are the only plastic-based cages on the market with a pull-out bottom grille. The lower positioned cups help contain mess and keep the cage area free of debris. The elevated body mesh also prevents debris from getting stuck at traditional catch points along the bottom of the bird cage. These cages include 2 plastic cups,;3 perches and are designed for parakeets, cockatiels and other small-medium birds. Built-in seed guard, along with elevated cage body and lower cup placement reduces seed debris. Elevated cage body eliminates most common debris catch points. Creates a path for seeds and other debris to flow back into the cage. Eliminates debris transfer between stacked cages. Pull out bottom grille and drawer Snug-fit Squeegee-edged removable drawer: Tight fitting, flared edges eliminate debris build up and catch areas. Eliminates gap between base and drawer. Debris flows directly into drawer. Removable bottom grille: Front access removable grille. Grille slides out and back in easily for quick cleaning. Allows for easy cleaning without cage disassembly. 2 Plastic cups included. 3;Perches included.? 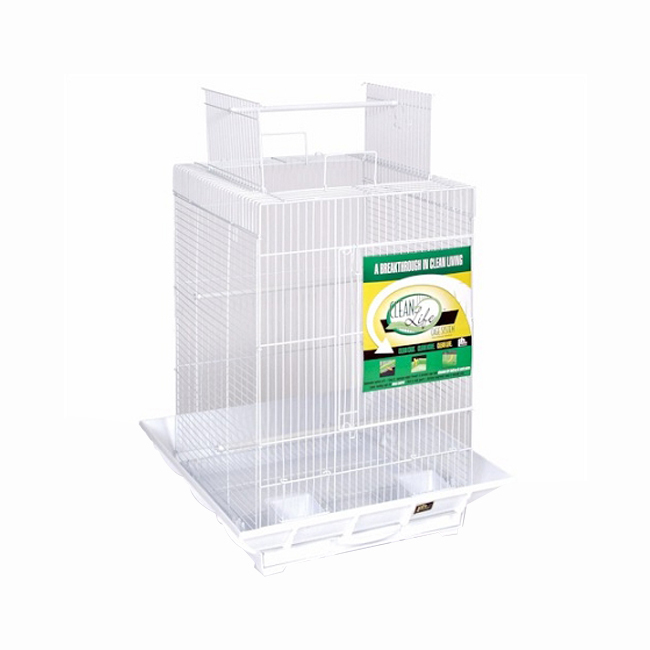 Features Cage Dimensions: 18" L x 18" W x 27" H. Base Dimensions: 22" L x 22" W. 1/2" Wire Spacing. Wire Gauge: 13 16 Superior construction. Uniquely molded plastic base. Integrated seed guard. Color: Green Base with White Wire Every detail of the Clean Life Play Top Bird Cage system has been designed for form, functionality, and affordability The intelligent design and patented features of the Clean Life system reduce or eliminate scattered debris and make cage cleaning a snap Bird owners will spend more time enjoying their birds, and the birds will thrive in the cleaner living environment Payment Shipping * Payment via PayPal is preferred and should be made within 7 business days after auction close * Processing takes an additional 2 to 3 days for orders from this seller * All items are shipped via Ground unless otherwise indicated. * Please indicate a physical address with your payment to ensure the fastest possible processing time * Please allow 7-10 business days for items to arrive after shipment. * Shipping discounts are offered for combined purchases. Contact us after auction close to indicate what other additional items you'd like to purchase. *Additional shipping rates will apply for shipments outside of the 48 states. Please contact us before purchasing for pricing information on shipment rates to your state. Returns Specifying Color Options Returns can be made within 30 days after the order is received. If a product is returned, customer is responsible for return shipping, and will receive a full credit for the amount of the product only (not including shipping and handling). If the product you're interested in has multiple colors, please indicate your color selection with your PayPal Payment. If no color selection is indicated our shipping department will randomly select a color to send. Should you have any questions, please contact us before the auction closes. What is our return policy? Clickhere2shop is proud to be able to offer a 30 day return policy for purchases made through clickhere2shop as well as through partner channels.To qualify for a refund, the product must be returned within 30 days of delivery. A restocking fee of up to 20% may apply. Products returned after 30 days of delivery are eligible for replacement or exchange only. Original shipping costs and return shipping costs are refunded without penalty only if the received item was defective, damaged at the time of receipt, or if the incorrect item(s) has been received. If a product is returned for any other reason, original shipping costs are not refunded, even if the original order included free shipping. Orders that are refused, undeliverable, or otherwise unable to reach the customer due to customer error may be charged return shipping in additional to the original shipping charges. clickhere2shop inspects all product returned to its warehouses, and, if the item is found to not be defective, shipping fees will apply and/or a partial refund may be issued. You can expect to receive your refund within 3-4 weeks of shipping your package back to us. In most cases you'll receive a refund sooner. How do I return a product? To return a product, please contact our customer service team. At that time you'll be issued an RMA (Return Manufacturer Authorization) number and provided instructions for how to return your purchase. Please be sure to refer to our return policy to ensure your product is eligible for return. If you are outside the 30 day return policy window, your purchase may only be eligible for replacement or exchange. Feedback If for any reason you're not able to leave 5 star feedback, please contact us so that we can help resolve any concerns or issues you may have with your purchase. We pride ourselves on the best customer service possible, which is evident of our current feedback rating and satisfied customers.